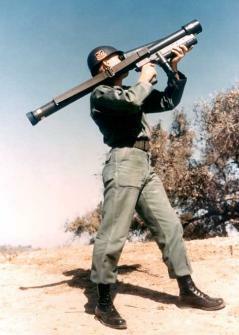 The FIM-43 Redeye was the first man-portable air defense system (MANPADS) fielded by the U.S. Army and U.S. Marine Corps, and was the direct predecessor of today's widely-used FIM-92 Stinger missile. Around 1948, the U.S. Army started to look for a new infantry air-defense weapon, because existing .50-caliber machine guns were ineffective against the new fast jet-powered aircraft. Several systems based on guns or rockets were evaluated, but none of these were sufficiently promising to warrant development. In 1955/56, Convair began studies of a man-protable light-weight infrared-homing anti-aircraft missile. In November 1956, the results of these studies (a missile named Redeye because of the infrared homing device in the nose) were presented to the U.S. Army and USMC. In 1957, an official requirement was written around the projected capabilities of Redeye, and in April 1958, Convair was awarded the first contract to start development of the Redeye missile system. Development goal was a shoulder-fired missile with a diameter of 70 mm (2.75 in), and a total weapon weight (including the bazooka-type tube launcher) of not more than 9 kg (20 lb). 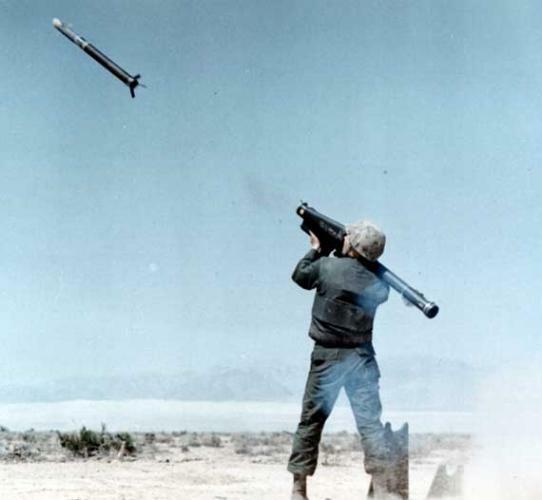 Full scale development began in July 1959, and in March 1960 the first Redeye test rounds were fired (not yet using the portable launcher). 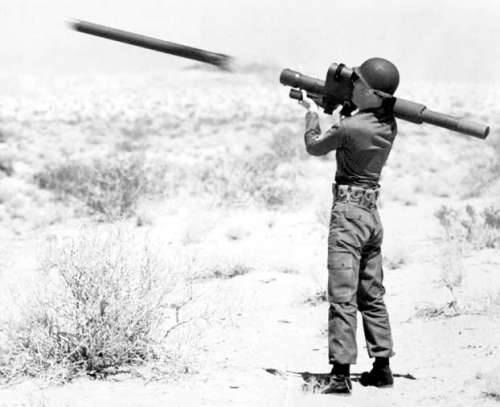 In May 1961, the first firing from the tube launcher succeeded, and in October that year, the first live shoulder launch of an all-up Redeye round occurred. It had been originally planned to have an operational Redeye system ready for production in 1962, but technical problems delayed the program. The Redeye missile was slower, less manoeuverable, and its seeker less accurate than planned. However, because it was still much better than any other existing infantry air-defense system, it was ordered into limited production as Weapon System, Air Defense, XM41 Redeye Block I. In June 1963, the Redeye Block I missile was designated as XMIM-43A. The Block I systems were delivered between 1965 and 1966, and were almost exclusively used for test and evaluation work. The XMIM-43A missile was fired from the XM147 launcher, consisting of the launch tube, the gripstock, and an XM59 telescopic sight assembly with a target acquisition indicator. The operator could acquire and track a target through the sight, and was notified by a buzzer in the gripstock as soon as the infrared seeker, which used a thermoelectrically cooled PbS detector cell, had locked on. 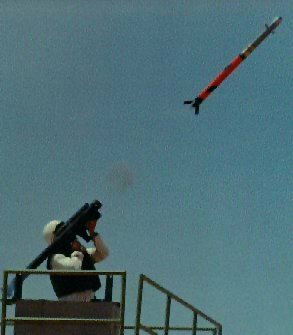 When the trigger was pulled, the missile was ejected from the tube by the booster charge of the missile's XM110 solid-propellant rocket motor, and after travelling about 6 m (20 ft), the XMIM-43A's sustainer motor ignited. The missile's flying surfaces (which were extended after launch) consisted of four cruciform stabilizing tailfins, and two movable control surfaces near the nose. The XM45 blast-fragmentation warhead was triggered by an XM804 impact fuze. Development of an improved Redeye Block II system, designated XM41E1, began in 1964, and the first XMIM-43B Redeye Block II missiles were delivered in April 1966. Improvements included a new gas-cooled detector cell in the missile's seeker, a slightly redesigned XM147E1 launcher, and an improved XM45E1 warhead. In February 1967, the first XM41E1 systems were issued to U.S. Army units for initial training. Around 1966, the DOD's missile nomenclature system was extended to include an F-for-Individual launch environment letter, and the Redeye's designation was accordingly changed from MIM-43 to FIM-43. The XMIM-43A and XMIM-43B were redesignated as XFIM-43A and XFIM-43B, respectively. The XFEM-43B was a test and development version of the XFIM-43B with special telemetry equipment to record missile performance. In 1965/66, General Dynamics developed the final Redeye Block III configuration, initially designated XM41E2. The corresponding XFIM-43C missile retained the XFIM-43B's gas-cooled seeker, but had a new XM115 rocket motor, XM222 warhead, and XM814 fuze. The XM171 launcher of the Redeye Block III system had a new XM62 open sight, and upgraded electronics for compatibility with the new missile. The XFIM-43C could manoeuver with up to 3g, and single-shot kill probability against jets was evaluated by the Army as 0.4. The XFEM-43C was the telemetry-equipped version of the XFIM-43C for test and evaluation. In May 1967, production of Redeye systems switched from Block II to Block III, and in March 1968, deliveries of Block III systems to operational Army and Marine Corps units began. In late 1968, the Redeye Block III was finally declared fully operational standard equipment. The Redeye system was therefore redesignated as M41, and the production Redeye missile became the FIM-43C. At some time in the late 1970s or early 1980s, the "X" was dropped from the designations of all earlier missiles, resulting in FIM-43A/B and FEM-43B/C designations. However, this was largely a "paper" action because the -43A/B variants no longer existed. In the same time frame, the designation FIM-43D was allocated to an upgraded FIM-43C, but unfortunately I don't have any details about the nature of the upgrade. The FIM-43 Redeye had some operational shortcomings, the most severe of which was its ineffectiveness in head-on engagements. IR missile homing devices of the day could essentially only home on the hot exhaust of an attacking aircraft. This meant that aircraft could only be engaged when they were already leaving the area, i.e. the ordnance may already have been dropped. In the late 1960s, an air-to-air derivative of the Redeye was studied, and in May 1969, the designation AIM-43D was requested by the U.S. Army for this variant. However, the request was turned down pending a decision for full-scale development of the air-to-air Redeye, which in the end never materialized. In September 1969, the production of the Redeye was terminated after about 85000 rounds had been built. As early as 1967, studies for a significantly improved Redeye II system began, and in March 1972, this was renamed as FIM-92 Stinger, q.v. for futher information. Beginning in 1982, the Redeye was gradually withdrawn from service, as the new Stinger was deployed. In 1995, the last Redeye missiles of the U.S. armed services were dismantled.